Epiphora, or abnormal tearing, occurs because of blockage in the lacrimal drainage system, which impairs normal tear channeling into the nose. Recurrent infection may also occur as a result of the stagnation. The dacryocystorhinostomy operation, which involves fistulization of the lacrimal sac into the nasal cavity, may alleviate the symptoms. The operative approach to the sac may be external or endoscopic. The latter approach may use rigid telescopes or the microscope. It avoids injury to the medial canthus and/or pathologic scar formation. Active infection of the lacrimal system is not a contraindication to surgery. It is much less bloody and messy than the external approach. The success rate is comparable to the external approach. It requires specialized training in nasal endoscopic surgery. The endoscopic equipment is an expense. An image depicting the anatomy of the lacrimal drainage system can be seen below. Schematic coronal section through the lacrimal drainage system. Toti first described the external approach in 1904; West described the endonasal approach in 1911. The latter approach fell out of favor because of difficult visualization and endonasal access to the lacrimal sac. However, with the newer, rigid telescopes, these difficulties have been overcome, resulting in a resurgence of the endoscopic technique. As normal access to the nose for the tears is impaired, a neopassage is defined from the lacrimal sac to the nose. The occurrence of symptoms may be related to congenital or acquired causes. Acquired causes include recurrent dacryocystitis and canaliculitis; dacryolithiasis; lacrimal system tumors; nasal pathology obstructing drainage; and trauma, which may be iatrogenic. An unidentifiable cause contributes to an idiopathic etiology. 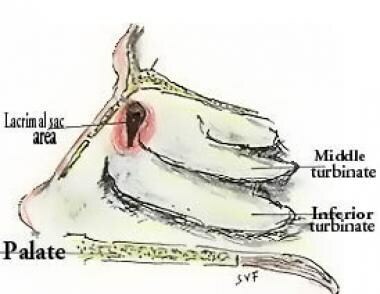 As a result of the blockage of the nasolacrimal duct, normal tear flow into the nose is impaired. This leads to epiphora. The stagnation of tears in the lacrimal sac and the adjacent conduits promotes infection and its accompanying sequelae. Patients may present to an ophthalmologist with socially unacceptable unilateral or bilateral epiphora interfering with vision. Persistent neglect of the symptom may induce chronic dacryocystitis with purulent drainage from the canaliculi. Inflammation of the skin in the region of the medial canthus may occur with acute exacerbations. The lacrimal punctum, which lies near the medial end of each lid margin, opens into a canaliculus. The upper and lower canaliculi lead to the lacrimal sac, which lies in the lacrimal fossa formed by the frontal process of the maxilla anteriorly and the lacrimal bone posteriorly. 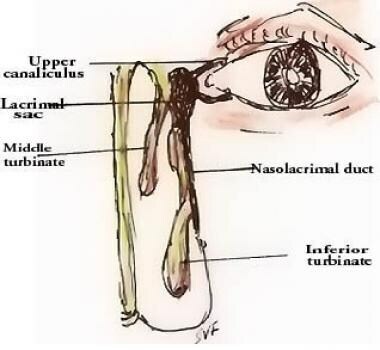 The nasolacrimal duct originates at the inferior end of the lacrimal sac and slopes caudolaterally to open in the inferior meatus of the nose. This opening is protected by several variable folds of mucous membrane that act as valves preventing retrograde air aspiration. The images below give a schematic view of the area of the lacrimal sac. Schematic endoscopic view of the area of lacrimal sac. Schematic axial section at the level of the lacrimal sac. The aqueous secretion of the lacrimal gland is covered by a film of mucus from the tarsal conjunctiva. This is further covered by a film of oily secretion from the meibomian glands. Evaporation is hence impeded, and the flow of tears occurs from lateral toward the lacus lacrimalis medially. The palpebral fibers of the orbicularis oculi trigger blinking, a reflex act. Blinking pumps the tears out of the conjunctival sac. During the act, the puncta are turned inward and dip into the lacus lacrimalis. At this time, the lacrimal sac is drawn open, and tears are sucked up through the canaliculi. When the muscle relaxes, the lacrimal sac retracts to its original volume and the tears are pushed down the nasolacrimal duct. The lacrimal drainage system is represented in the image below. See Nasolacrimal System Anatomy for more information. Relative ophthalmologic contraindications include the dry eye syndromes. Other contraindications include bleeding dyscrasias and other systemic deficiencies that would jeopardize surgery. Marcet MM, Kuk AK, Phelps PO. Evidence-based review of surgical practices in endoscopic endonasal dacryocystorhinostomy for primary acquired nasolacrimal duct obstruction and other new indications. Curr Opin Ophthalmol. 2014 Sep. 25(5):443-8. [Medline]. Jung SK, Kim YC, Cho WK, Paik JS, Yang SW. Surgical outcomes of endoscopic dacryocystorhinostomy: analysis of 1083 consecutive cases. Can J Ophthalmol. 2015 Dec. 50 (6):466-70. [Medline]. Kiroglu AF, Cankaya H, Yuca K, Kiris M. Endoscopic dacryocystorhinostomy with a T-type ventilation tube. J Otolaryngol. 2007 Jun. 36(3):164-7. [Medline]. Longari F, Dehgani Mobaraki P, Ricci AL, Lapenna R, Cagini C, Ricci G. Endoscopic dacryocystorhinostomy with and without silicone intubation: 4 years retrospective study. Eur Arch Otorhinolaryngol. 2016 Jan 5. [Medline]. Sprekelsen MB, Barberan MT. Endoscopic dacryocystorhinostomy: surgical technique and results. Laryngoscope. 1996 Feb. 106(2 Pt 1):187-9. [Medline]. Golan S, Chen Y, Levine B, et al. Does long-term success from endoscopic DCR correlate with early post-operative reduction in tearing?. Am J Otolaryngol. 2018 Jul 10. [Medline]. Anari S, Ainsworth G, Robson AK. Cost-efficiency of endoscopic and external dacryocystorhinostomy. J Laryngol Otol. 2007 Jul 19. 1-4. [Medline]. Pearlman SJ, Michalos P, Leib ML, Moazed KT. Translacrimal transnasal laser-assisted dacryocystorhinostomy. Laryngoscope. 1997 Oct. 107(10):1362-5. [Medline].